General Characteristics: Tall, erect, stocky, maturing within 8 to 12 months, producing from 5 to 10 oha; the conspicuous black edge is a distinguishing feature. Petiole: 100 to 140 cm. long, dark green heavily suffused with dark reddish-purple especially on upper half, dark purplish at apex, white at base, conspicuously blackish at edge. Leaf blade: 45 to 65 cm. long, 30 to 40 cm. wide, 35 to 50 cm. from tip to base of sinus, sagittate, slightly concave, dark green; margins with a few large undulations; piko purplish; veins dark purplish on lower surface of lobes; lobes obtuse with narrow sinus. Corm: Flesh chalky white with yellowish fibers; skin white or yellowish. Inflorescence: Peduncle yellowish-green with faint brownish tinge, often reddish-purple at apex; spathe 32 to 37 cm. long, the lower tubular portion 5 to 6 cm. long, reddish-purple, the upper portion dark yellow with reddish-purple margins, bent and drooping, usually tightly folded but sometimes slightly open near constriction; spadix about 11 cm. long, the sterile appendage conspicuous, about 13 mm. long. 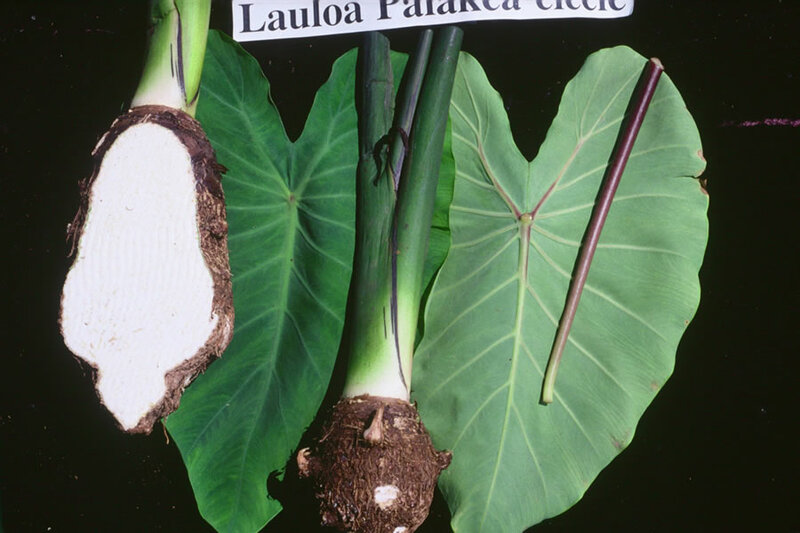 Origin, and derivation of name: Native variety; four members of the Lauloa group have the descriptive name Palakea, which refers to the soft, white consistency of the cooked corm. The distinguishing suffix, eleele, indicates the black edge of this form of Lauloa Palakea. Distribution: Grown quite extensively in Kona, Hawaii, almost exclusively as upland taro. Use: Used primarily as a table taro, being considered superior to both Lauloa Palakea-keokeo and Lauloa Palakea-ula although the poi is considered inferior to that of any of the standard poi taros; highly favored as a medicinal taro by the early Hawaiians. Remarks: This variety is one of the hardiest of the taros, withstanding adverse weather conditions under which other varieties will not survive. Under favorable conditions it yields well and is comparatively early maturing. It is less acrid than most taros; hence its popularity for medicinal purposes.